2014 has been a year where the Maker community in Singapore has grown by leaps and bounds. It was a wonderful year for the Maker Faire team as well, as we were more and more involved in the community events this year, with the aim of promoting Making in Education and families. We started the year a Senja Cashew community club, where we supported the Hackidemia sessions at the Senja cashew Bursary awards. We also began to bring the Maker movement into our own walls. We had the great pleasure of hosting several visiting Makers and inviting them to share, both with the Science Centre staff, as well as the visitors in Science Centre. April saw us in Shenzhen, learning from the Maker Faire Shenzhen. I must say that we were completely blown over by the scale and seriousness of the Chinese Makers. A direct result of the Shenzhen visit was the family workshop by Karkhana – Make break, Innovate. Dipeshwor and colleagues, who were passing through Singapore on their way back from Hackteria in Yogyakarta, stopped to share their experiences, as well as conduct a short workshop on cardboard games. When I say short, it often means that the workshop lasts way longer than planned, as participants usually continue to tinker and often do not want to leave the Maker workshop. Thats a very good thing, though I have now started to bring along cookies to the facilitator de-brief that happens after the workshops. 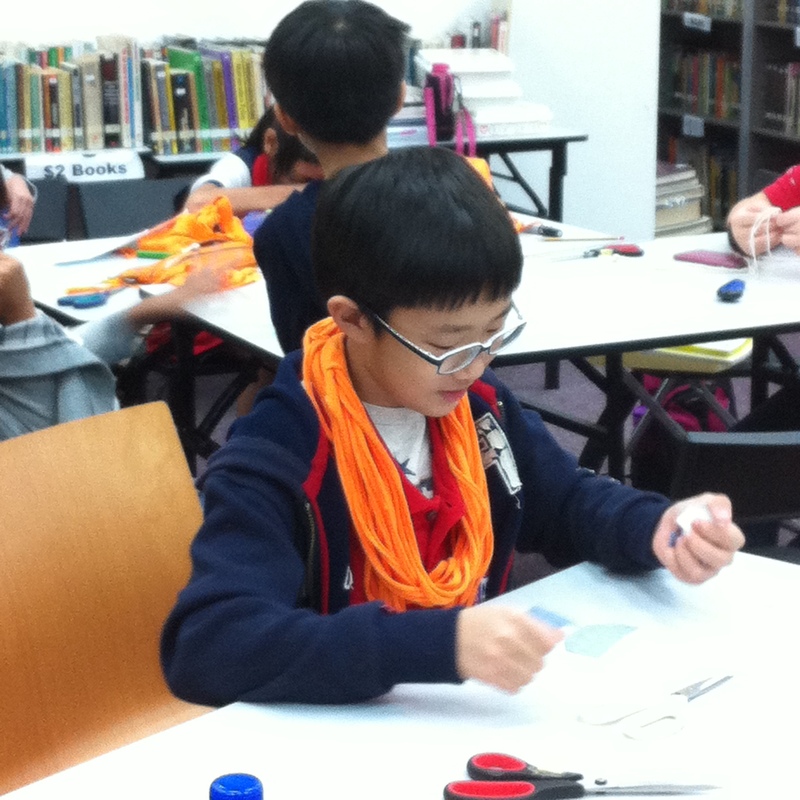 Two projects, which were the highlights of this year, were the Maker Faire bookbinding day and the Yarnbomb SG project. Both the projects were completely owned and organized by the community, and were excellent learning opportunities in how very creative projects can come out in a bottom-up manner. After the warmth and generous support of the community through these projects, we launched the Hangouts initiative, a programme that allows the community to propose year round initiatives at the Science Centre, with the aim of reaching out to the public through tinkering and Making. 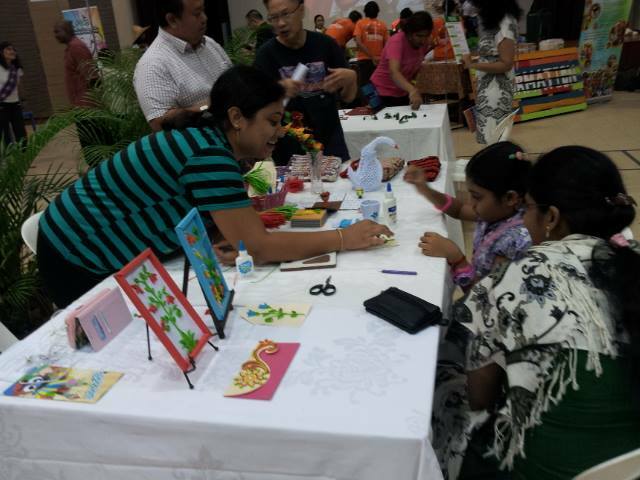 In July, we held the biggest Singapore Mini Maker Faire so far. 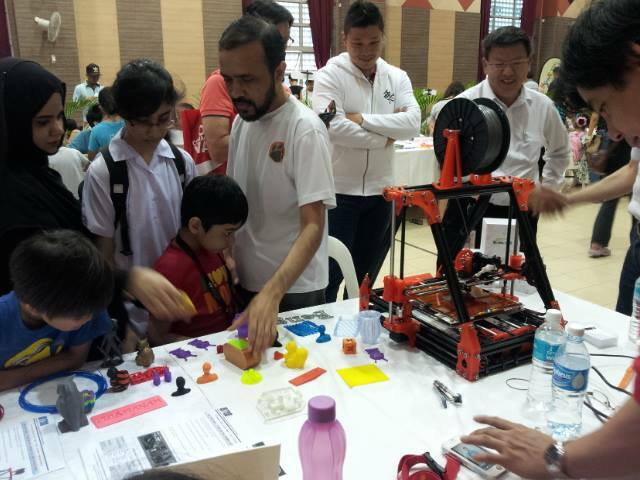 Combined with the Singapore Mini Maker Faire Education day, which was held just a week prior, the Singapore Mini Maker Faire 2014 saw a gathering of over 250 makers with more than 150 maker exhibits, booths and workshops. Held at Senja Cashew community club, this was also the first time that the Maker Faire went to the heartlands in Singapore. The effect was awesome as we saw grandparents and grandchildren working, learning and Making together. After a short break, the team came together again in October, to begin the Maker workshops for families. These workshops were an opportunity for kids and parents to experience learning with very loose structure and mostly experience the activities rather than learn about them. Facilitated by community Makers and volunteers, we also decided to make the workshops themed, so as to illustrate that Making is both interdisciplinary and widely applied. Watch out for the next Maker workshop in February, where we will be doing Making in Art on 14th February , 10am. Another highlight of this year was our visit to Maker Faire Japan. Invited by self proclaimed “Crazy Japanese Maker” Mazakasu Takasu, we spent a week in Tokyo immersing ourselves in the creative culture in Japan. We were astounded by the smooth way in which the Japanese transitioned from what could be considered as Japanese cultural crafts to stuff like Laser cutting and 3D printing – which are kind of the cornerstones of today’s Maker movement. This integration of the old with the new was almost seamless in Maker Faire Tokyo, leaving us completely open mouthed with amazement. Laser engraved Japanese wood – the japanese style engraving was supposedly from EEG signals. We also had the opportunity to discuss the burgeoning Maker Movement in Singapore and the Maker movement in Japan in an impromptu discussion with Nico Nico Beta – the Japanese equivalent of TEDx. We ended the year on two high events. In order to raise awareness of coding as we move towards the Smart Nation campaign, we ran the Hour of Code from 8-14 March. at the Science Centre. With tech showcases from John O Brien, Henry Wong and several other Makers supplementing the online and offline coding activities, the event reached out to almost 2000 people. It was heartening to see kids as young as five years old grit their teeth as they worked out the higher levels of Lightbot – a gaming interface that taught children the basics of computer programming. We also ran our first ever Maker Immersion camp in December – a programme where we collaborated with local Makers to impart the idea of Making to children. Around 30 children took part in the Maker immersion camp, where they went through sessions on design thinking, fabric hacking, electronics and coding, interspersed with talks on the Maker culture and Making. It was a very busy 2014 and 2015 looks even more busy and happening. We do hope that we can reach out to enable more families to embrace the process of Making as part of their daily lives. Watch this space for more stories and happenings from the Maker Faire team. Thirty one children took part in our first ever Maker Immersion Camp. For three days, the children were exposed to tools such as the hot glue gun, drills, screw drivers, pliers etc. They also learnt basic maker skills like taking things apart, wood working, fabric hacking sewing, and basic electronic circuits. The camp began with an introduction and icebreakers session, followed by Design Thinking for Makers by Elda Webb. The children learnt about Empathy and the importance of communication for good design. Something different was that kids were required to design something for their partner, as opposed to themselves. Susan also spoke to the children about the need for upcycling and the environmental impact of garbage. In the afternoon, there was woodworking, where the kids learnt to drill and make a plant press. Photos to come. The camp ended with an inspiring talk by Stefania Druga from Hackidemia, who shared with the children the many projects done by children around the world. We asked the kids after the camp what they would like to learn next. Here are some of the responses. How to build a musical room? And those, I believe, gives us enough material for several more camps. Keep learning an Keep Making! Prime Minister Lee Hsien Loong announced a week ago that Singapore students should be taught to “code, prototype and build things, to fail fast and learn quickly.” Hour of Code SG aims to teach children how to begin coding in an easy and interactive manner. The Hour of Code was launched in the US in 2013 as an online campaign to introduce coding to the public in a friendly and interactive manner. The Hour of code campaign introduces kids aged 5 and up into programming. This year, we are bringing the Hour of code to Singapore through a series of interactive activities. Activities are free, no pre registration is required. Admission to Science Centre applies to non members. How to build a robot car: This Robot car can be autonomous using sensors to avoid obstructions and find his ways. Additionally, it can be modified & equipped with Bluetooth module in order to communicate and be controlled by Smartphone. Play a game which has artificial intelligence: I got interested in Computer Science at an early age when playing against a chess program and wondering how a machine could play better than a person. Through this project, I got to go back to my favorite topic in Computer Science and had the opportunity to interact with users and developers from around the world as we worked together to improve the software. What lives inside a computer? Join in a tear down session where we will take apart an old computer and peripherals to understand what are the components that make up the machines that we use everyday. Illustrations of the usefulness of coding : I have a few processing sketches, ranging from complex scientific simulations to simple quick sketches, that I could showcase as illustrations of the usefulness of coding. A possible example: http://andygiger.com/science/e-coriolis/.